Qproducts has created an incredible eco-friendly desk that is 100% recyclable. The Qdesk is an amazing product geared for the classroom that is made of polypropylene which doesn’t corrode like metal or warp like wood. 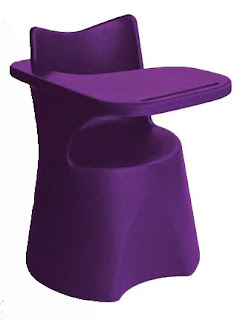 It’s unique molded shape is ergonomically designed to offer posture support for kids while keeping them comfortable during their studies. Parents who have just a small space for studying will also love the qdesk’s compact size. The is also a great feature for schools who are short on space. Offered for left and right handed students in three sizes; 13, 15 and 17 inches. A variety of colors are available, however it can be made in any custom color with a minimum production time of three weeks.